It was a glorious September Saturday. I was in Sydney’s Northern Beaches doing a story time and craft session at a local library. While most of the kids were busy colouring in, I noticed one young lad walking up and down the stairs in the story pit. He had a black cape tied around his neck, was oblivious to all around him and was muttering in a very dramatic way, “Beware the deep dark forest! Beware the deep dark forest!” I was intrigued. What was going on in his young mind? What adventures was he having in his imaginative world? When I gently asked him what was in the forest that he had to beware of, he paused, flicked his cape over his shoulder, eyed me suspiciously and said, “Beware. The. Deep. Dark. Forest!” And stamped off. I was left slightly stunned but utterly fascinated. It was one of those “I’ll have what he’s having” moments. How could I enter that world? I so desperately wanted to be there. 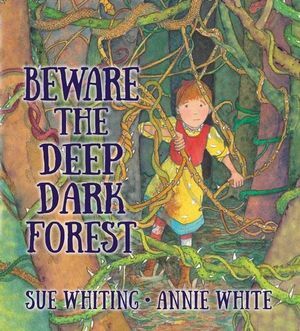 By the time I navigated the very long dFRrive home that afternoon I had the germ of an idea for a possible picture book story emerging, aptly named Beware the Deep Dark Forest. This young boy not only inspired the title of the book, he also informed the intent. He gave me a very clear purpose. I wanted to tap into those young imaginations, to write an immersive robust story with rich storybook language and a strong narrative arc. And as I started to nut out the various story elements of character, plot, setting and theme, a hero’s quest story began to emerge in the style of the fairytales that first ignited my passion for story when I was a child. The fantasy world of fairytales was particularly appealing. Once you step into a fantasy, fairytale world, all normal boundaries and logic are suspended. Anything is possible! A pumpkin can become a grand carriage; a young girl can enter a house belonging to bears; a princess can sleep for one hundred years. And, in my case, a young girl can walk into a dangerous forest alone to search for her beloved pup, swing across a ravine and defeat an enormous muddy troll! How empowering is that? Fairytales allow the young reader to experience challenge, conflict and fear in the safest possible environment: within the pages of a book, and best of all, often secure on the lap of a caring adult, who is sharing the story with them. Through having characters face struggles alone, whether it is the impoverished Jack climbing a beanstalk, or Little Red Riding Hood walking through the woods to bring food to an ailing grandma, young readers are able explore what it means to be brave, resourceful and take responsibility. It is probably a little unfair and misleading to let children believe that life is always easy. It’s not! Yes, it is wondrous and often joyful, but it can also be tough and sad and scary. Through the fantasy adventures in the pages of fairytales, our children can explore this, can learn about tackling life’s obstacles head on, about finding solutions, making decisions and facing the consequences of those decisions. They can discover that with hard work and courage, there is often a path through adversity and happier days ahead. They have the opportunity to experience and hopefully build some capacity for emotional resilience. In an age of helicopter parenting and overprotected bubble-wrapped kids this, I believe, is more imperative than ever. After all, we all have our own deep dark forests to face. For kids it might be something as simple and as terrifying as stepping alone into the schoolyard for the first time. As the grownups, we have a responsibility to equip them for this. There was something else crucially important for me to address in my “fairytale”: it was time for some girl power. My hero had to be a heroine. Girls desperately need stories where the lead character is not only female, but is courageous, strong, resourceful and independent. Girls need not only to see their gender reflected in stories, but also to know that it is possible for them to be the brave one, the heroine. Equally important is the need for boys to read books with strong courageous heroines. Boys too need to recognise, acknowledge and applaud the amazing capabilities of girls. I am very proud of Rosie and her courage, determination and resilience. I am proud of her dad and grandma who allowed her to take responsibility for Tinky and who knew they had done their best to prepare her for whatever dangers lurked within that forest. I am proud too of that deep dark forest: a place full of metaphor and possibility. And I wholeheartedly thank that young boy with the cape in that library years ago for opening my mind and igniting my imagination and I hope that this tale and the others like it, new and old, will ignite young imaginations and inspire a new generation of courageous, resilient kids. The world sorely needs them! Sue Whiting lives and works in a sleepy coastal village near Sydney, where she spends her days dreaming up adventures for her characters and trying to write them down. 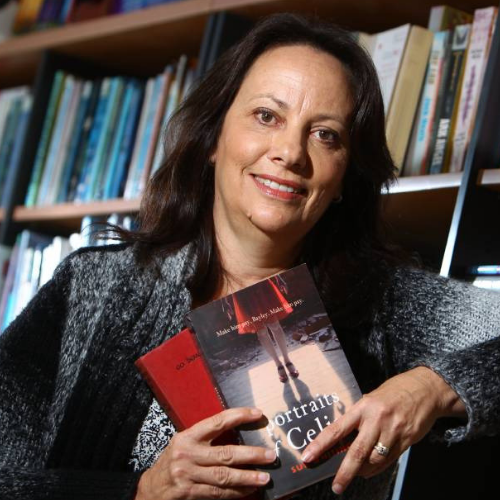 Sue has written numerous books in a variety of genres: fiction and nonfiction, picture books through to YA, including the bestselling The Firefighters, and the award-winning A Swim in the Sea. 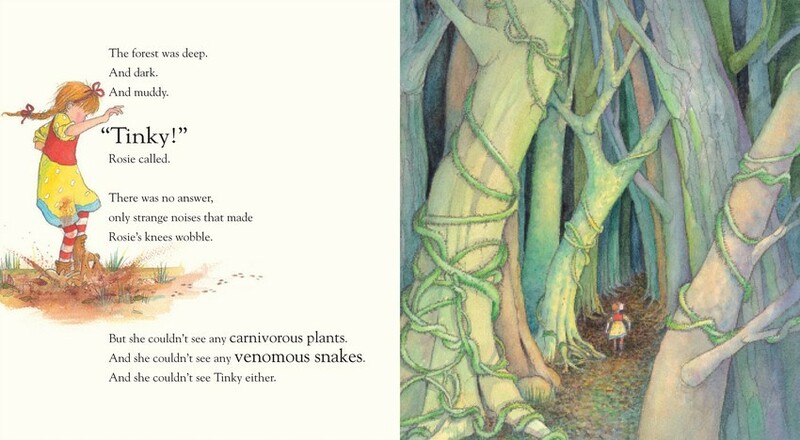 Her Nature Storybook, Platypus, illustrated by Mark Jackson, was a CBCA 2016 Notable Book. A former primary school teacher with a special interest in literacy education and children’s literature, Sue is a highly experienced speaker who loves sharing her passion for story and storytelling, reading and writing with people of all ages. She also works as a freelance editor, writing coach and mentor. A whimsical tale from award-winning author, Sue Whiting, for courageous readers aged 3 to 6. Luminous illustrations in the style of the classic fairy tales by illustrator Annie White capture the innocence, the curiosity and the cleverness of young Rosie. A picture book for kids who love scary-but-funny stories about courage, bravery and friendship.